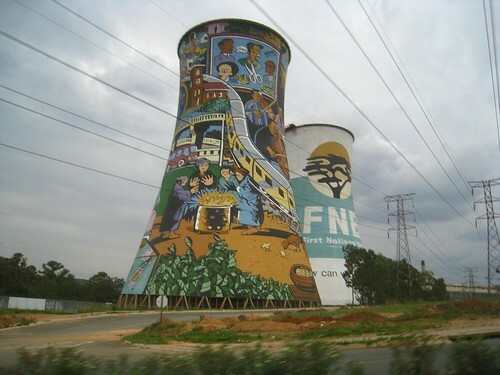 The story of Soweto's people is painted on one of the two iconic cooling towers. When visiting South Africa, it can be tempting to pass on Johannesburg altogether (aka Jo'burg, or Jozi amongst the locals). It has a reputation of being very dangerous, and lacks the natural beauty of Cape Town. Still, I found there was more than enough to do to keep me busy for a few days. Most hostels are in the suburbs, as with any big city, there are legitimate reasons to be concerned about safety. I chose to hire a guide through my hostel, and went on two separate trips around the city with him. On the second one, his young son even joined us for lunch and a trip atop Africa's tallest building. Great article, Soweto a place full of history. One ought to find specials that offer day tours of this wonderful place.